Is art and craft voiceless? Have you ever caressed the golden thread stylishly sewn through velvety muslin fabric? Indeed, our primary rendezvous with art does differ, but how it makes us feel, doesn’t. Exploring India through its artistic art and craft is an interesting journey. Different and of course, exotic! Fondly called as the ‘Heartland of India,’ it is lauded for its long living artistry. Stone-craft, pottery, Chikankari, Zari embroidery, glassware, textile printing and carpet weaving are few specialities of Uttar Pradesh. Additionally, these artistic endeavours have years of history. For example, hand printing is the oldest craft of Uttar Pradesh. Its history dates back to 1714 AD when Farrukhabad-the city famous for this craft was founded. Nawab Muhammad Khan Bangash had played a pivotal role in its establishment. 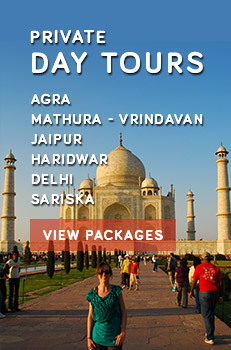 So, embark on a special journey with Uttar Pradesh Tour Packages and explore your own craving. Do visit the famous Bari Bazar in Varanasi, famous for variety of Banarasi silk sarees and is one of the major manufacturing centres of handloom sarees in India. 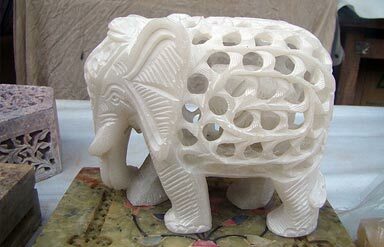 The Stone Craft of Uttar Pradesh has flourished due to the Muslim rulers of the state especially Mughals. The Taj Mahal in Agra is an excellent example of this craft. The other main cities include Agra, Varanasi and Fatehpur Sikri. Thin marble slabs/stones are etched for hours to give them a meaningful shape and design. Intricate carvings are made by hour long chiselling. Walk through the narrow lanes of Agra and you will spot garden furniture, decorative items and many more similar crafted out of marbles. 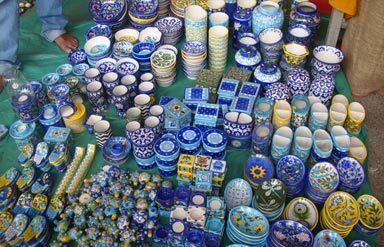 Pottery is popular throughout the state. However, potters of Meerut, Khurja and Hapur are more skilled in it. In fact, the history of Khurja pottery is nearly 600years old. Surahi, a vessel with long neck is the most popular item created through pottery. It is used in summers to keep the water cool. These vessels are embellished with beautiful floral designs and patterns. Vibrant colours are used, mostly orange and yellow, against a plain white background. In spite of being fully handmade, these items are priced at very reasonable rates. 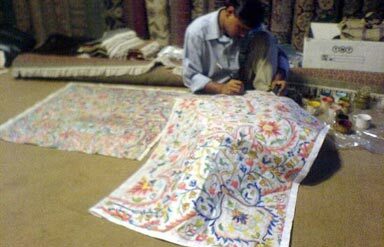 Chikankari or chikan work is synonymous to the city Lucknow. It is basically skilful embroidery done on fabric using white thread. This intricate needle work owes its existence to Empress Nur Jahan, wife of Emperor Jahangir. There are two main types of Chikan embroidery- flat and embossed. Flat embroidery involves simple sewing sans any loops or knots in threads. Bukhia and Katawa are the two famous styles under flat embroidery. Bukhia embroidery is basically stitches made in v-shape while Katawa includes motifs cut from same fabric on which it is stitched to give an opaque appearance. Zari or Zardosi embroidery is famous in Varanasi. Rich golden threads are used to create beautiful designs and patterns on saris and other dress materials. Banarasi sarees are famous for their zari work. They are an indispensable part of Hindu marriages in North India. The traditional thread work is done using real thread of gold and silver which makes the fabric expensive. Beads and stones are the other embellishments used institching. Some of the artisans also use synthetic thread instead of gold and silver. Such fabrics are heavy and bear an exquisite look. The fabric is used for making evening attires, bridal dresses and other occasional wears. Firozabad is famous for glassware especially the colourful glass bangles. Huge machines are used to create items like utensils, pots and myriad of toys. ‘Firozabad’ is also called as the ‘City of bangles’. Presumably, during ancient times foreign invaders had brought many glass items with them. They were later discarded and melted in a furnace. This marked the beginning of glass art in the city. Beautiful chandeliers, jewelleries, decanters, cutlery sets and small trinkets are created using glass. The process involves basically heating of glass at high temperature. The matter softens and is then moulded into desirable shapes. The art also creates employment for women by engaging them in small-scale industries. Carpet weaving is another most famous handicraft practised in the state. Bhadohi city, about 40km away from Varanasi has excelled in this craft. History of carpet weaving in this city traces its roots to 16th century when the area was under the reign of Mughal Emperor Akbar. Today it is the largest carpet manufacturing centre in the country and is also called as ‘Carpet City’. You will find the finest of silk carpets sold in this area. They are adorned with delicate Persian patterns and look stunning. It is one of the oldest craft in the country. Farrukhabad city is lauded for it. Traditional patterns like butis (polka dots) and the ‘tree of life’ are made by hands on this fabric. The patterns are of dark colour, drawn against a soft coloured backdrop. Nowadays wooden blocks are also used to create these patterns. ‘Paisley pattern’ also famed as ‘Mango’ or ‘Persian pickles’ are the droplet shaped motif created using the butis. It is the second most popular pattern created by hand prints. It is commendable to see how the art has still managed to survive in this modern era of machines. Buying art and craft souvenirs is an excellent way to preserve travel memories. So, opt for Uttar Pradesh Tourism Packages and get started!